from one holiday to the next…. At the risk of jinxing things, it’s been a pretty good holiday season so far. Starting on Thanksgiving, there’s a steady stream of Things to Celebrate til New Years. Aside from the big holidays, there’s also Jim’s birthday on the sixth of December and Solstice which is celebrated here in the neighborhood with a Sunday night bonfire and a lot of good food. His family does a big family Christmas thing which was fun last year, and it’s a good time to head down to see my family when I don’t have classes here and when the temperature drops into single digits. My landladies don’t celebrate Hanukkah, I don’t think, but they have artist friends who do. One of them made a large menorah for a local synagogue and made them a smaller version. They found some nifty candles and asked if I’d come over and take a few photos and email them to their friend. 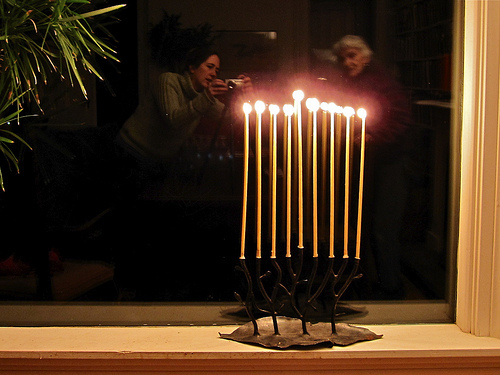 This was a few days before the actual last night of Hanukkah, but it was great to see the candles all glowy against the dark night [at 6 pm!] and I took a few nice photos. I enjoyed the letters to the editor in the New York Times after the David Brooks Op Ed talking about Hanukkah. “Sometimes a festival of lights is just a festival of lights.” Happy holidaytime, whatever you may or may not be celebrating.